These eight vendors represent the best of the local Gainesville culture. Whether you’re a student at UF or a resident of Gainesville, you should make sure to put the Union Street Farmers’ Market on your bucket list of things to do. The farmers’ market has been a staple of local culture since 1996 and now hosts over 60 local vendors each week. You can find the market downtown at Bo Diddley Plaza every Wednesday from 4-7 p.m. While every vendor at the market is amazing and features their own unique and locally produced products, we wanted to feature a few of our favorite vendors. Since the market can be slightly overwhelming (in a good way) and it might be hard to figure out which tents to stop by, here are eight vendors that you must look for when you visit. You can catch Stuffany’s behind their red and white-striped booth every week at the farmers’ market. 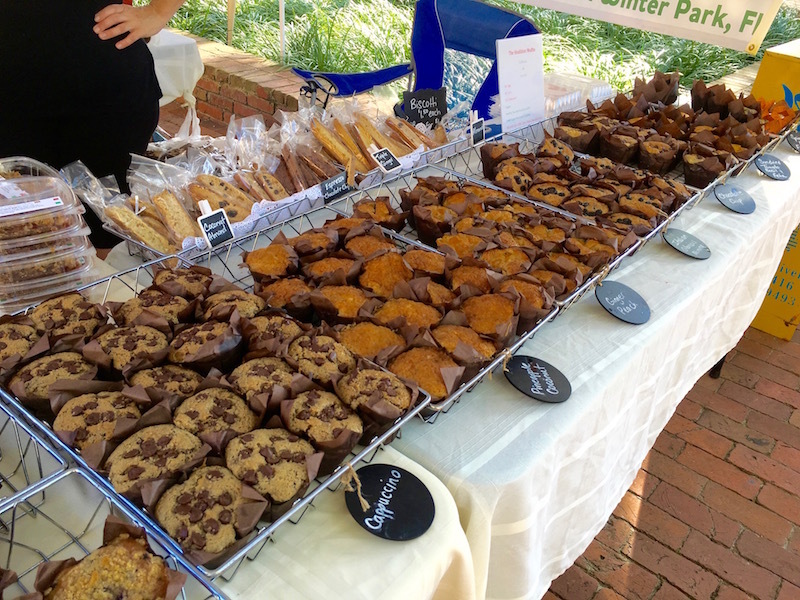 Each week you will find a variety of seasonal goods, whether they be homemade pretzels, marmalade, cakes, cookies, pastries or breads. Stuffany’s also sells crafty knick knacks like customized socks and the owner does her own woodworking too. 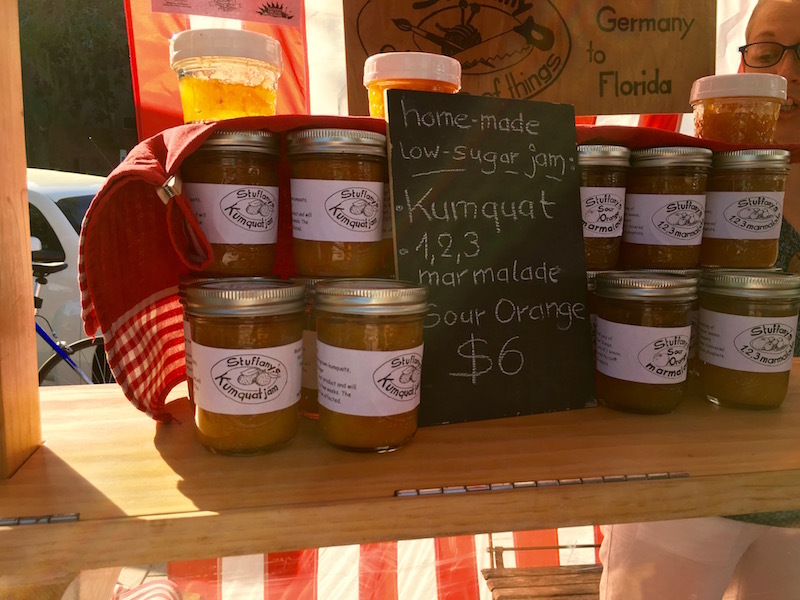 #SpoonTip: If you have the chance, test out the Kumquat marmalade and slather it on a nice piece of toasted bread or crackers (or, of course, just eat it straight from the spoon). As college students it’s hard to imagine a day without coffee, so why not support our local economy and get amazing coffee at the same time? 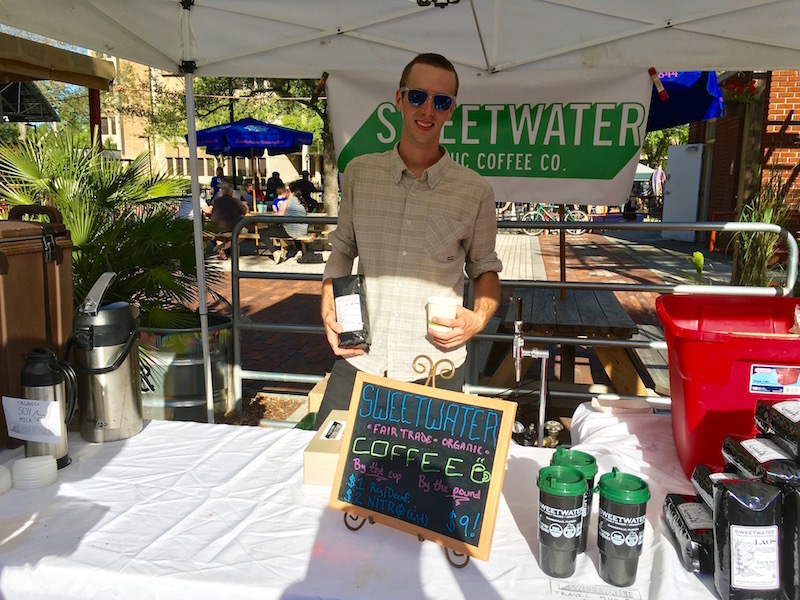 Sweetwater Organic Coffee is passionate about supporting small-scale coffee farmers; as a member of Cooperative Coffees, Sweetwater trades with several small coffee co-ops so they can roast their coffee daily. #SpoonTip: If you’re worried about getting your caffeine fix for the week, you can find everything from coffee, espressos, teas, and even home brewing tools at Sweetwater. From now on the only place you should be getting your salsa is from Bear Bottom Boyz (spelled with a z, or else you may see something unsavory if you Google them). I personally tried the pineapple mango salsa, while my friend got the cranberry salsa–to say we were satisfied is an understatement. 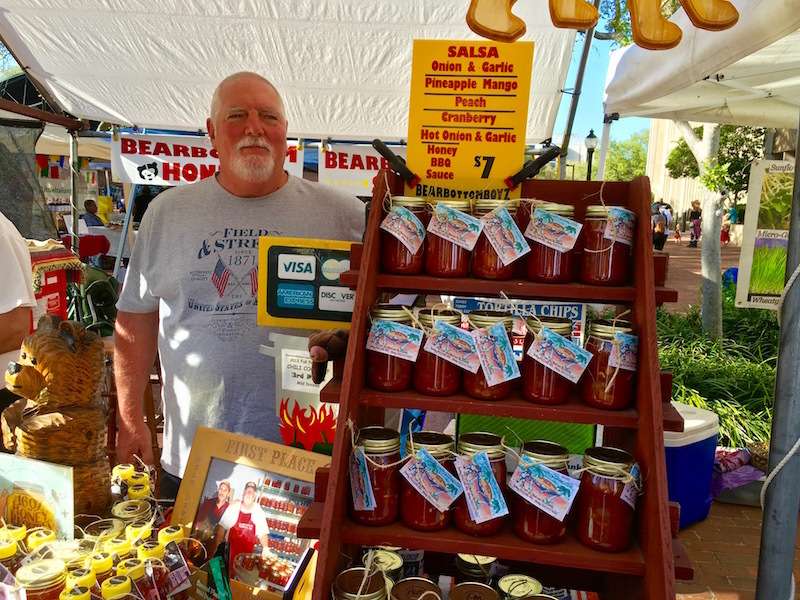 Besides their award-winning salsas (they have other crazy flavors like Peach and Onion & Garlic), they also sell some killer barbecue sauce and honey. #SpoonTip: The owners Andy and Bobby recommend serving their cranberry salsa over a block of cream cheese for the ultimate snack. Even though Gainesville’s “winter” is coming to an end, you can never get enough lip balm, especially when it’s made from a local honey bee farm. Beulah Honey is a honey bee farm ran by Liana Teigen–her products range from beeswax candles, lip balm, and of course, honey. #SpoonTip: Beulah Honey also sells beeswax “candy,” which is the perfect way to satisfy your sweet tooth without the unhealthy sugars of your average piece of candy. If you’re a sucker for dipping bread in olive oil and/or balsamic vinegar, then Strega Nonna’s Market is for you. 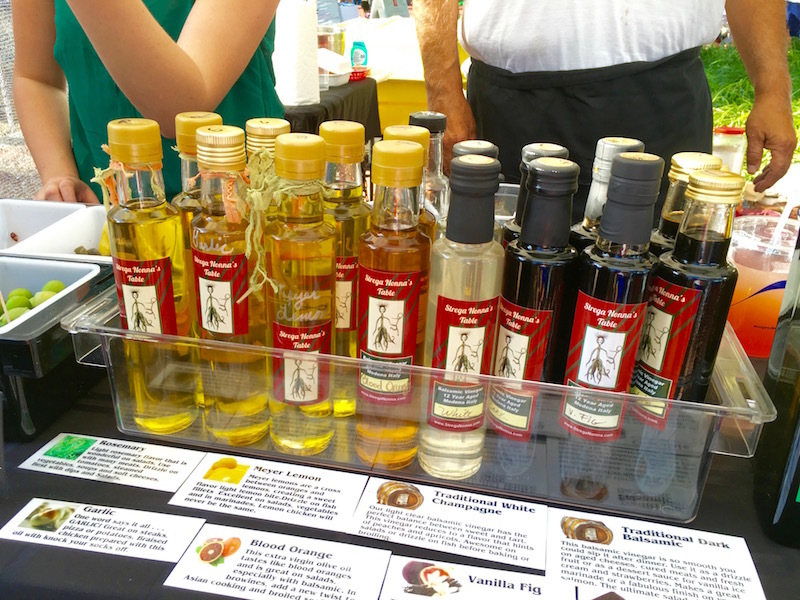 Strega Nonna’s offers a unique variety of olives, oils and vinegars like blood orange olive oil, Meyer lemon olive oil, and chocolate balsamic vinegar. They also offer tons of olives ranging from holiday mix pepper olives to green butter Castelvetrano olives. #SpoonTip: We bought a bottle of the vanilla fig balsamic vinegar, which we tossed with strawberries and goat cheese and piled on crostini. Money really can buy happiness, y’all, and it comes in the form of vinegar. With allergy season just around the corner, Land of Flowers Farms‘ raw unfiltered honey is just the thing you need. 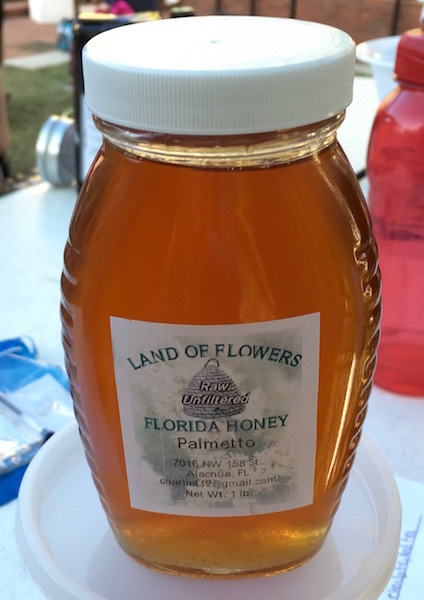 Land of Flowers is a family-run business that specializes in the organic honey and blueberries business, with two farms located right here in Alachua County. 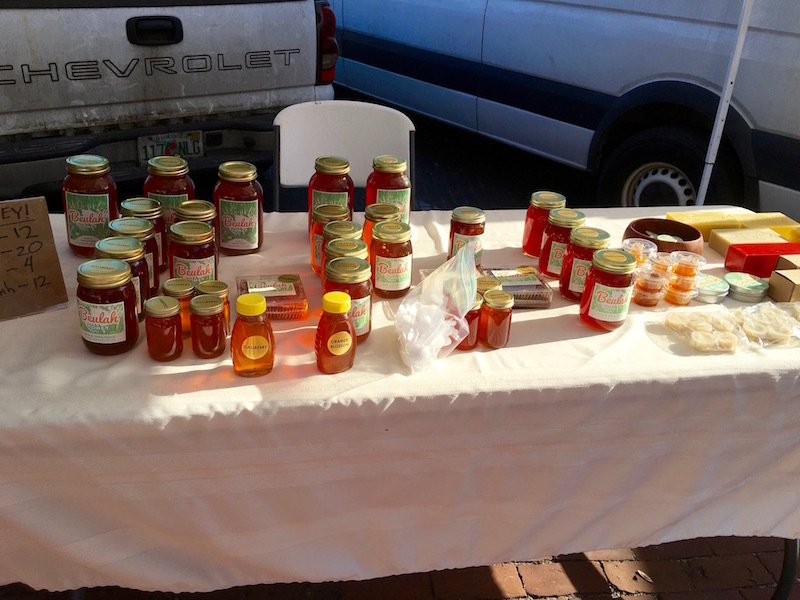 In addition to their fresh honey, you can find their beeswax candles at the market. #SpoonTip: We recommend pairing their delicious honey with brie and crackers, a yogurt/smoothie bowl, tea, or just straight up on a spoon. It’s hard to walk past My Little Italian Market and not purchase any of these amazing baked goods. Despite being in downtown Gainesville, I could really feel myself being transported to a little Italian market. You can find everything from muffins, biscotti, granola bars, and a variety of cookies here, so don’t worry about finding something you like. #SpoonTip: I highly recommend trying the homemade lemon curd cookies–the fresh lemon flavor is absolutely undeniable. Not to mention, these cookies are their bestseller. Think you can handle the heat? 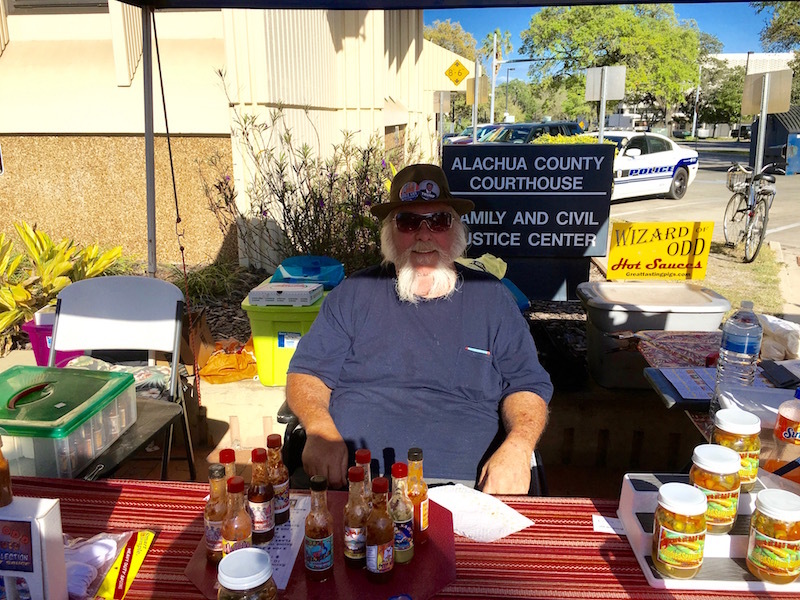 The man behind Wizard of Odd Hot Sauce is a master of heat and spice, and has created a line of undeniably delicious hot sauces. The sauces range from mild (which is great for wimps like me) to super spicy, so everyone can be satisfied. If you really can’t decide which bottle to choose, you can sample the sauces on crackers before making your big decision. #SpoonTip: Make sure to keep an eye out for their new flavor: Hot Apple Pie, which can be used as a dessert hot sauce.